One of the major characteristics of Chinese charms is the rebus or “visual pun” where a picture is used to represent a word. While it can sometimes be challenging, it is always interesting to figure out what, at first glance, the haphazard collection of animals and objects displayed on a Chinese charm are supposed to mean. A very knowledgeable collector of Chinese charms recently contacted me regarding an old Chinese charm he had just acquired. From the reading of the Chinese characters and based on his experience, he had a good idea of what the images on the reverse side had to be. But even knowing this, he was having difficulty identifying one of the pictures. Chinese charm with inscription "good fortune, salary, longevity and happiness"
The inscription on his charm reads fu lu shou xi (福禄寿喜) which translates as good fortune, salary (emolument), longevity and happiness. This particular charm is a good example of the Chinese fondness for visual puns or rebuses. 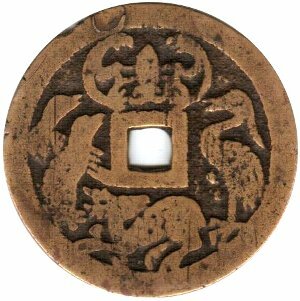 Knowing this, the four pictures on the reverse side should either be pronounced fu, lu, shou or xi, or “symbolize” good fortune, salary, longevity or happiness. This is the reverse side of the charm. At the very top is a bat flying upside down. The Chinese word for “bat” is fu (蝠) which has the same pronunciation as “good fortune” (fu 福) in the written inscription on the other side of the charm. But the “pun” goes even deeper. The Chinese word for “upside down” (dao 倒) happens to have the same pronunciation as the word “to arrive” (dao 到). Therefore, if a person were to say “the bat is upside down” (fu dao 蝠倒), it would sound exactly as if one had said “good fortune has arrived” (fu dao 福到)! As you have probably guessed, the image below the square hole has the same pronunciation as the Chinese character in the same position on the other side of the charm. The image is of a “deer” and the Chinese word for “deer” (lu 鹿) does in fact have the same pronunciation as the word for “salary” (lu 禄). There is an image of a bird to the right of the hole. In this case, the bird does not have the same pronunciation as the corresponding Chinese character (shou 寿) in the inscription, but instead is a traditional Chinese symbol with the same meaning of “longevity”. To the Chinese, the “crane” (he 鹤) is a symbol of longevity because it was believed to live to a very old age and also because its feathers are white. Truth be told, the artist that designed this charm long ago made a slight mistake which goes unnoticed by most people. If you look very closely, and if you know your birds, you will see that the bird is actually not a “crane”, which it surely was intended to be, but rather a “heron”. The “heron” or “egret” (lu 鹭), nevertheless, still works as a rebus because it shares the same pronunciation as the word for “salary” (lu 禄). To be consistent with the rebus theme of the charm, the picture to the left of the hole should be pronounced xi just like the corresponding Chinese character (“happiness”) on the other side of the charm. This is where my collector friend ran into a slight problem. He knew the Chinese word for “mandarin duck” is xi (鸂) but the image on the charm does not look like a duck! He had the correct pronunciation but the wrong bird. The bird is actually a “magpie” (xi qui 喜鹊) which has the word “happiness” (xi 喜) as part of its name. Even more interesting, the charm shows two magpies so the meaning is “double happiness” (囍)! I thank my friend for sharing with me this new addition to his collection. 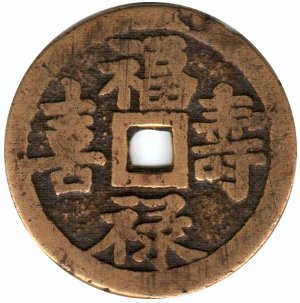 This old charm, which is 38 mm in diameter and dates from the Qing (Ch’ing) Dynasty (1644-1911), exemplifies the special characteristics of the Chinese language, the richness of Chinese symbolism along with the fondness of the Chinese for the rebus or “visual pun”.